I like the kind of travel that is like a long stretch, where you feel your muscles and your mind lengthening, your limits reached and extended. I like travel that goes beyond the Top Ten lists on TripAdvisor and into the places that you only learn about when you have time to stop and listen for a while to the heartbeat of a place. I’m not someone who enjoys travel that seeks to fit as many attractions and monuments as possible into the shortest time possible. Consequently, I gravitate to fewer, longer vacations over frequent, shorter vacations. My next vacation is three and a half weeks. And boy is it a doozy. I’m doing the Trans Siberian Railway. 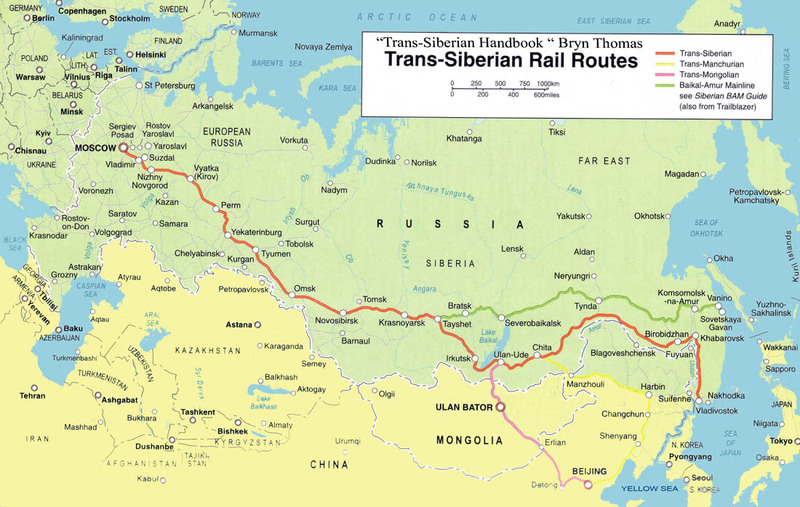 That’s right, y’all…THE TRANS-SIBERIAN RAILWAY! Map is from BaikalComplex.com. This site has loads of great information about Lake Baikal. You’ll note that there are several routes. The most traditional takes you from Moscow across Russia to Vladivostok. That is not the route I’m taking. I’m taking the Trans-Mongolian route, and am starting in Beijing. Instead of stopping in Moscow, I’m actually going a bit further, to Minsk. Along the way, I’ll be walking the Great Wall in China, sleeping in a ger in Mongolia, hiking along the coast of Lake Baikal, visiting the Kremlin in Kazan, and strolling the streets of Moscow. Plus enjoying other amazing, exciting, not-yet-announced stops. This trip has been more than a year in the planning. I’ll make every attempt to post regular updates along the route, as I have wi-fi access. It all starts next week….look for regular updates, beginning some time after September 9. Edited to add: View my traveling companion Steve’s pre-departure post here: Ready to Launch.